Ever wonder what I do with all my canned tomatoes or my backyard chicken eggs? 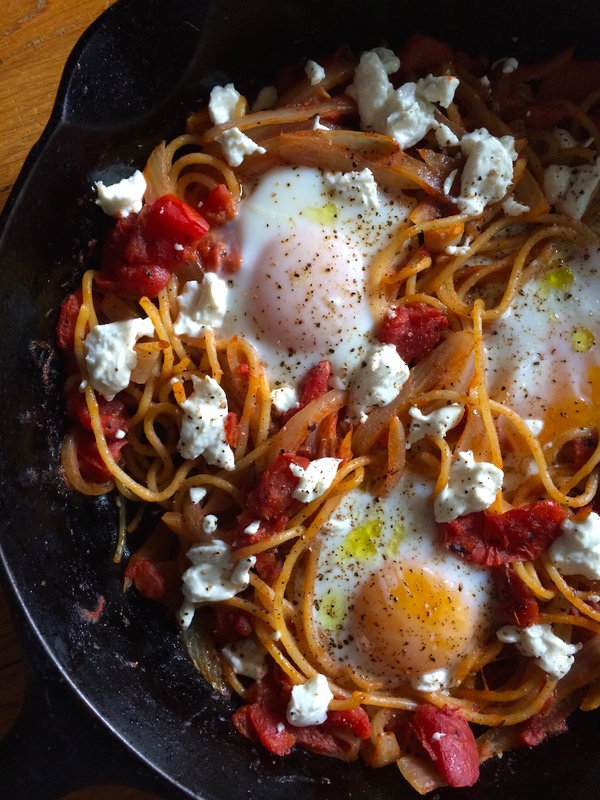 Here are two super easy recipes right out of your pantry: Fire Roasted Tomato Butter Sauce and Spaghetti and Eggs. 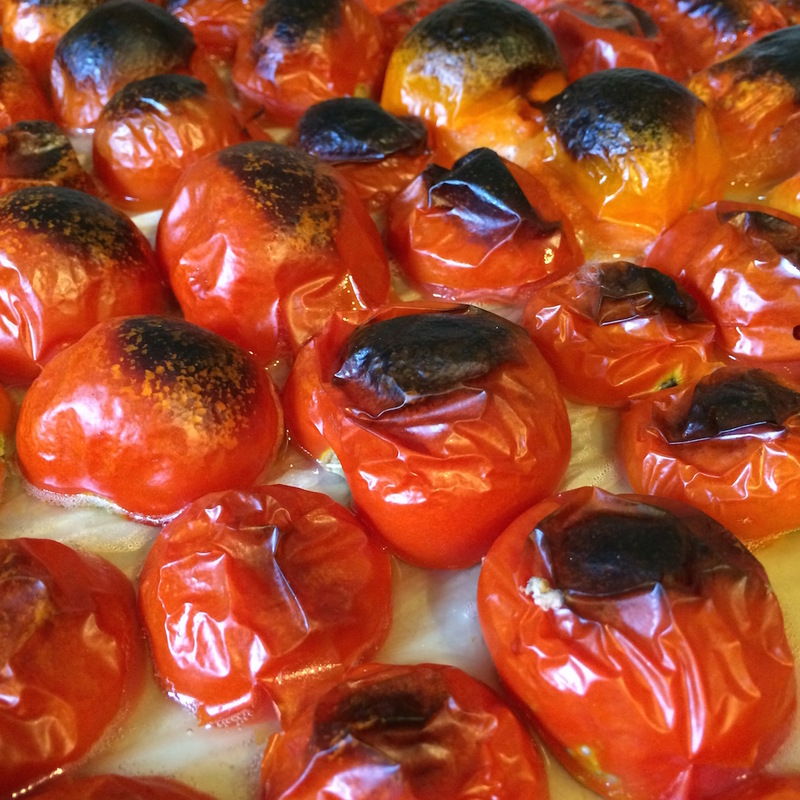 The Fire Roasted Tomato Butter Sauce is based on a super simple sauce by famed Italian cookbook author Marcella Hazan. Using nothing but canned tomatoes, onion and butter, you get an easy sauce that you can make in an hour any day of the week. 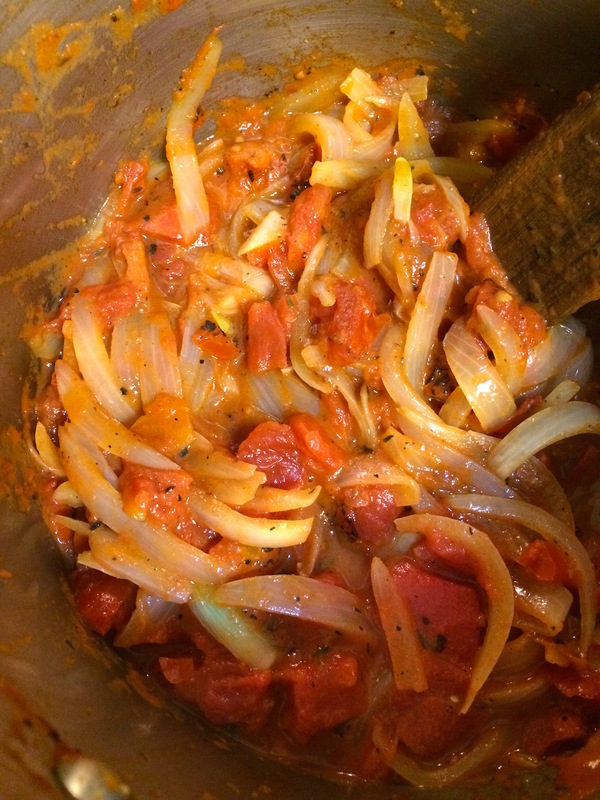 I’ve elaborated on the classic by using fire roasted tomatoes and slicing the onions, yielding a chunky sauce that I serve over pasta or roasted vegetables. Spaghetti and Eggs are the highest form of leftovers. I learned to make this dish from my stepfather, Paul, who’s Sicilian father had run a small Italian restaurant in his home town. If we had pasta, it always ended up in eggs the next morning, as did most of our leftovers. This dish got me through many an early morning physics test my senior year of high school, and became a staple frugal breakfast for me throughout college. Now a days with chickens in my backyard, we are never without eggs. And between my home grown, canned tomatoes and working for Muir Glen Organic, tomatoes are always around. So next time you have leftovers, whip up some spaghetti and eggs. You’ll wonder why you didn’t just make them for dinner. Made primarily from leftovers, this recipe can also be made from scratch if you have time on a weekend morning to make the sauce and spaghetti. Melt butter in a heavy bottomed pan, like caste iron. When bubbly, add spaghetti and fry until it begins to crisp slightly. Add fire roasted tomato butter sauce or other chunky tomato sauce to the pan, along with ground cumin and smoked paprika. Heat sauce through. Make 4 wells in the pan and crack an egg into each well. Cook on the stove top until the egg whites begin to set on the bottom and the sauce is bubbling. Then set under a broiler until the eggs are just set and the yolks are still soft. Remove from oven and sprinkle with parmesan cheese and blobs of goat cheese. Server immediately else your yolks will harden. Melt butter in a sauce pan. Add onions and sauté until softened but not brown. Add fire roasted diced tomatoes and juice to the pan. Simmer for 30 minutes, then season with salt and pepper before serving.